In fact, this is a rest day even though it does not look like one. With just under 110 km it is very short, there isn’t much climbing to do. The first 75 km the route follows the valley of the Saône river, through pastures and farmland with some small forest areas. Wine is grown on the other side of the river, on the slopes of the hills you see when you look west. At Chalon, you may want to stop for coffee and a snack. 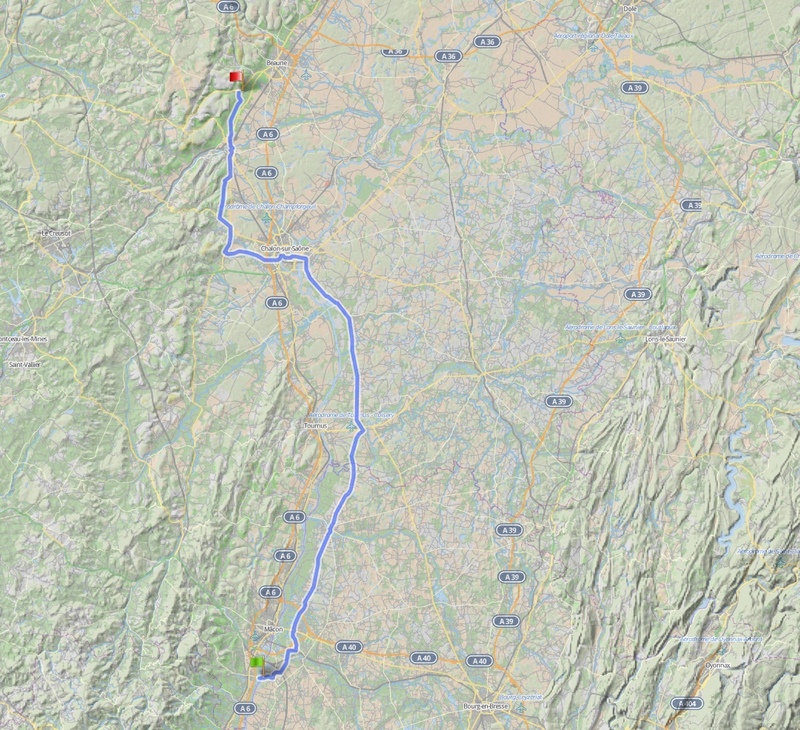 The remaining distance is just 35 km, and I have routed us through the vineyards away from the road that leads straight through. You may even want to wander off a bit more, taking even smaller roads and explore the villages you will cross. Our destination is Meursault, surrounded by wine, known for its white wines but also for the classic Burgundy red. The town has a nice square by the church and Mairie, with a few restaurants on various corners. It may be advisable to make reservations for dinner, so check out the places when getting to Meursault and make your choice. For those eager to do a bit of climbing for a nice view, you could follow me to a small village named St Romain, less than 10 km away from Meursault if I remember correctly. 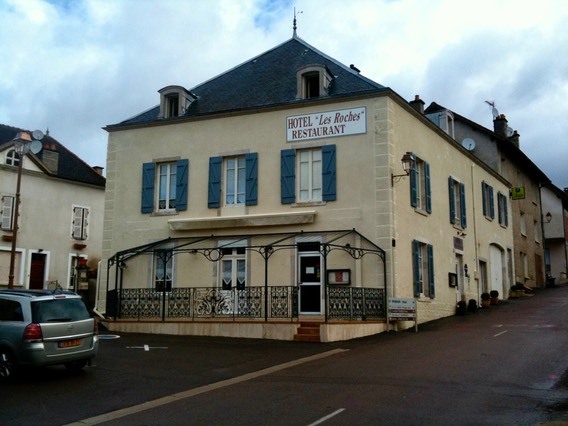 The village has a nice restaurant at the small Hôtel des Roches where I would like to reserve a table or two for dinner. I found a picture I took in 2010. Before sitting down I suggest to either ride or walk up the rocky hill to the old village. It is very pittoresque, really old and very quiet. From there, you could see the entire area and far beyond the river valley. I have been there a couple of times myself, have eaten at that restaurant and even stayed in that hotel – and can say the same about Meursault. Burgundy is the home of some of the most famous red wines, all made of Pinot Noir grapes according to old and rigid rules. You will have a chance to taste for yourself, so here’s a bit of guidance. This day and the next are perfect for getting some sense of the land and its wine. Enjoy. You know what? The next day is going to be just like this one.